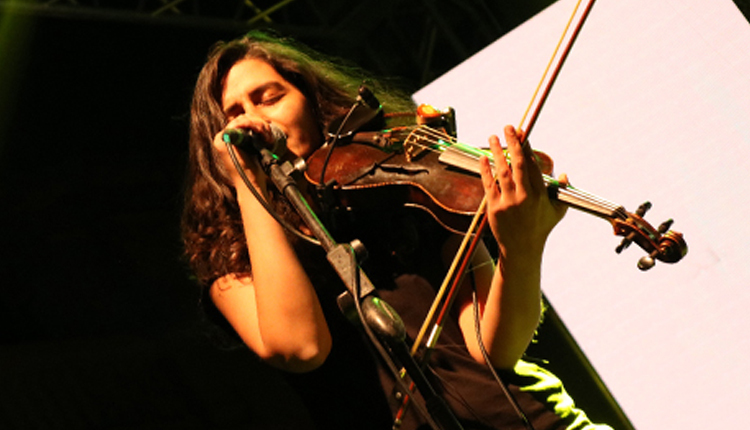 The Egyptian-Canadian metal band Massive Scar Era (MSE) played on Friday their first performance in Egypt since 2013, at the Greek Campus of the American University in Cairo, amid the ongoing Downtown Contemporary Arts Festival (D-CAF). After a rich event that saw three other performances, spectators enthusiastic in interacting with metal music, rarely played in the Arab country recently, with some singing along to the lyrics of MSE’s repertoire, banging their heads in the air. “I am thrilled with our return. So delighted that fans still remember our songs. This is an obvious proof that metal music is still present and demanded. It just needs a space. Like here at the Greek Campus. I see no problem to play again in such venues,” Egyptian lead vocal and guitarist Cherine Amr, who is currently based in Canada, told Ahram Online after the performance. Amr founded the band in Alexandria back in 2005 with violinist Nancy Mounir in an initial attempt to create an all-girls band and together they blended their distinct musical backgrounds influenced by metal, classical and Egyptian music to shape-up MASCARA, their peak being ‘Ab3ad Makan’, a song featured in the Egyptian award winning movie, Microphone (2010). “MASCARA is a very special project for me. It’s the first band I ever played with and Cherine is one of my most favourite closest friends,” expressed Nancy, one of the Egyptian underground’s familar faces, most known for her collaboration with Dina El-Wedidi in addition to appearances with various bands, lately with Grammy Award winner Fathy Salama and Algerian Karima Nayt in concert two weeks ago. Accompanied by Canadian drummer Julia Geaman and bassist Dylan Wijdenes-Charles, MASCARA featured Egyptian percussionist Ahmed ‘Bezra’ Badry, in an attempt to mix traditional oriental beats with standard metal. “It was a great experience for all of us. With the joining of Bezra, we will be using oriental rhythms as the starting point of the creation. We used to build our sound on melodies, but now we want to build upon rhythms,” reveled Cherine. Answering a question regarding the topics of their lyrics, the lead vocalist said, “After we interacted with the Canadian members [that joined later], our latest track, Colour Blind (released a year ago) focused on minorities rights in different countries. “I was missing the old songs and it is the first time to play the new song live. I was very happy to see the crowd show energetic interaction despite the long day,” Nancy said, echoing Cherine. The band played almost all their songs at the concert, including Colour Blind, Oblivious, 30 Years, Comes Around You, Pray, Alive and others, but they insisted not to perform ‘Ab3ad Makan’ in spite of consecutive requests by fans. The band, who previously played in Denmark, Hungary, France, the US, the UK, Germany and Palestine, in addition to many concerts across Egypt, are preparing for a heavy schedule ahead as they are touring abroad in April, June, and August. “We hope we play more in Egypt as most of our upcoming concerts are abroad,” Nancy said. Ahram Online talked to concert attendees and most of expressed excitement about the band and metal music generally. Metal music has a wide fan base in Egypt with many bands playing covers and a few creating originals, but the genre’s concerts frequently face difficulties with a history of issues with the authorities. The women music event of D-CAF festival had three other performances, starting with the first ever performance for promising Nubian talent Maram, who was appreciated for playing some groovy Sudanese and Egyptian covers, followed by an impressive performance by Shereen Abdo Band, singing her original repertoire that also includes folk, with a special appearance of American folk girl-band T-Sisters. The D-CAF eighth edition combines 40 different events, including performing arts, concerts, urban vision performances, new media events, film screenings, and workshops, featuring artists from Egypt. Collaborating with Ismailia Company, the events takes place across many Downtown Cairo venues, including Sherefeen Street that served as one of D-CAF’s stages in the festival’s first three editions, and the Tamara Building, with both locations being recently renovated.